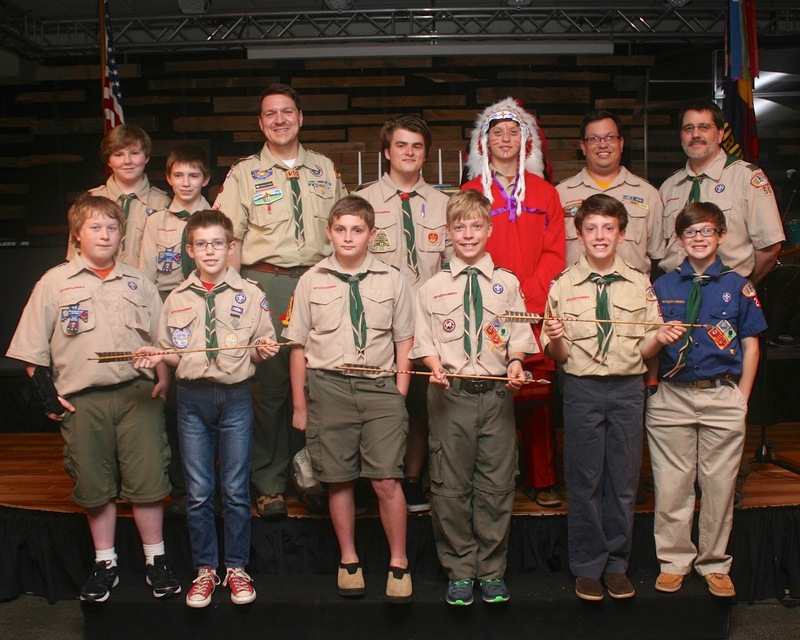 Arrow of Light awards in hand, five Pack 29 Webelos Scouts crossed the Scouting bridge from Cub Scouts to Boy Scouts on Friday, April 10, thereby becoming Troop 50's newest Boy Scouts. While they are new additions to the official troop roster, their steady attendance at recent troop meetings has already made them familiar faces at troop activities. SPL Andrew, Troop Committee Chair Rob Stanford, and Assistant Scoutmaster Billy Lytle. Pack 29 conducted its crossover ceremony at Auburn United Methodist Church, which serves as the its chartered organization. Rains throughout the day and evening on Friday unfortunately forced the pack to move the ceremony indoors, and despite missing elements like a campfire and torches that are standards for the pack's annual ceremony, pack leaders and Scouts did a great job retaining a warm Scouting spirit for all who attended. Senior Patrol Leader Andrew and Assistant Senior Patrol Leader William assisted in the ceremony as one of the principle ceremony actors and "backstage," respectively, and the troop was well represented by other Scouts and leaders present to receive our newest members and their families. The five Webelos joining Troop 50 were among more than a dozen Webelos Scouts participating in the event and transferring membership from the pack to area Boy Scout troops. Many of Troop 50's Scouts and leaders are alumni of Pack 29. The 2015 ceremony marks the third consecutive year the troop has benefited from a strong class of new Scouts (and families) crossing over from Pack 29. In addition to celebrating the achievements of the pack's Webelos Scouts, pack leadership also lauded the contributions of many of its leaders who were "retiring" from their Pack 29 service. Among those with Troop 50 connections were Rob Stanford, the troop's committee chair who until last year served as the pack's cubmaster, and for the past year has served as the pack's committee chair; Lysha Stanford, troop committee member who has served as pack trainer and, as Rob referred to her, "his better half"; Clyde Wikle, who served for many years has provided leadership for his son's den and organized pack activities as its outings chair; and Mary Jo Wikle, who assisted in chairing a number of pack committee duties over the years. Please visit the troop's online photo album for more photos from the crossover event.